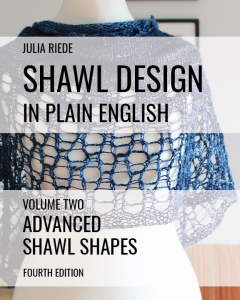 The most comprehensive resource on shawl design available today. 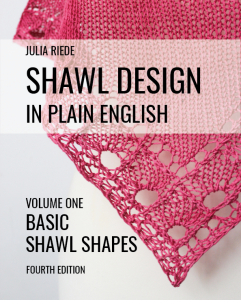 Update 2019-02-01: Shawl Design in Plain English will get a fourth edition in 2019. News and updates on the 2019 edition will be posted here. Are you tired of following patterns in shawl knitting and want to create your own? 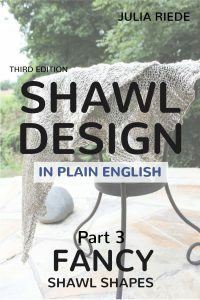 If your answer is yes, Shawl Design in Plain English has been written just for you! Did you know? You can buy all three volumes in one book and save over 20% compared to single purchases. This book teaches you how to create your own patterns for rectangular, square, triangle, winged, circular, semi-circular, crescent, vortex, star shaped, polygons, S-shapes, annular, and Faroese knitted shawls by unveiling the principles of how to turn your ideas into written instructions for shawl patterns.